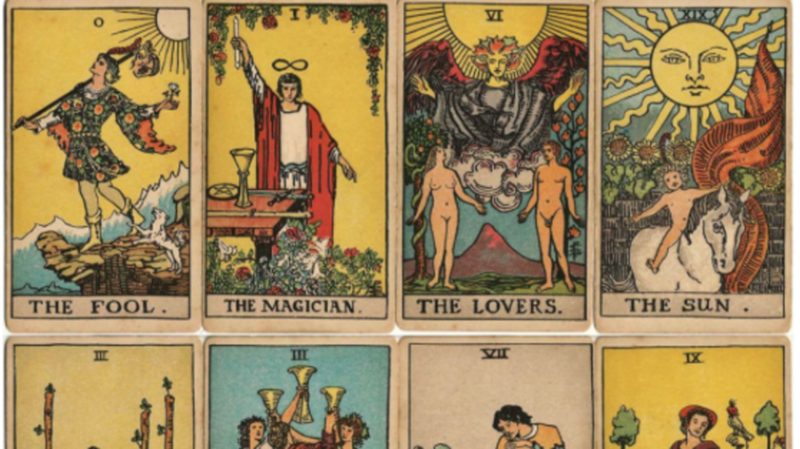 Top: A selection of trump cards (top row) and pip cards (bottom row) from the first edition of the Rider-Waite deck, circa 1909. Via the World of Playing Cards. Above: Cards from a Tarot de Marseille deck made by François Gassmann, circa 1870. Photo courtesy Bill Wolf. Two hand-painted Mamluk cards from Turkey (left) and two cards from the Visconti family deck (right), both circa 15th century. This woodblock version of the classic Tarot de Marseille was published around 1751 by Claude Burdel. Photo courtesy Bill Wolf. A hand-colored set of tarot cards produced by F. Gumppenberg, circa 1810. Photo courtesy Bill Wolf. A few of the cards from Etteilla’s esoteric deck, reproduced by Grimaud in 1890. One of Matthews’ favorite decks is the Lenormand published by Bernd A. Mertz in 2004 based on a design circa 1840. Photo courtesy Caitlín Matthews. This Lenormand-style oracle deck shows a mixture of playing card and fortune-telling illustrations, circa 1870. Photo courtesy Bill Wolf. “Les Amusements des Allemands,” circa 1796, has many overlaps with Lenormand decks. Via the British Museum. Trump cards from the Tarrocchini Bolognese designed by Giuseppe Maria Mitelli, circa 1664. On the Geografia deck, the symbolic imagery is reduced to a small colored segment at the top of each card; the rest is related to global geography. Via eBay.